I chose the tiniest little Ikea Micke desk thinking there wasn't going to be enough room, when I could have easily chose a desk a foot longer without cause for concern. Maybe even two feet if I was feeling daring. It's a really lovely little desk though, so that's okay. I'm pretty glad it has a drawer for all my notebooks and nail polishes, seriously that's all that's in there. I have my little copper basket filled with beauty products and candle for added decoration to make myself feel stylish *swish* and my absolute fave Sandra Dieckmann print on display because it makes me happy. I'm going to have to buy some more of her work asap because it's all amazing. To the right there's my little wicker storage thingy-bob with lots of my beauty products in. I don't like keeping beauty stuff in the bathroom, it makes me cringe so I keep aaaaall of my makeup and skincare in this area, even if it is a pain to walk back and forth to the bathroom because I forgot my cleanser, or I then forgot my face cloth, I never said life was easy. To the left I have those IKEA shelves that everyone owns. I got the medium sized because I originally wanted it led horizontally (may still move it) but changed my mind at the last minute when we put it up. I have a box in every other shelf to hide away all of my art supplies, sketchbooks, beauty stuff and loads of other stuff. They hold SO MUCH, it's incredible. They also do a good job of blocking the sun so I can actually see my laptop when I'm working, though I would prefer them the other way around I do still have to see what I'm doing. Such dilemma. 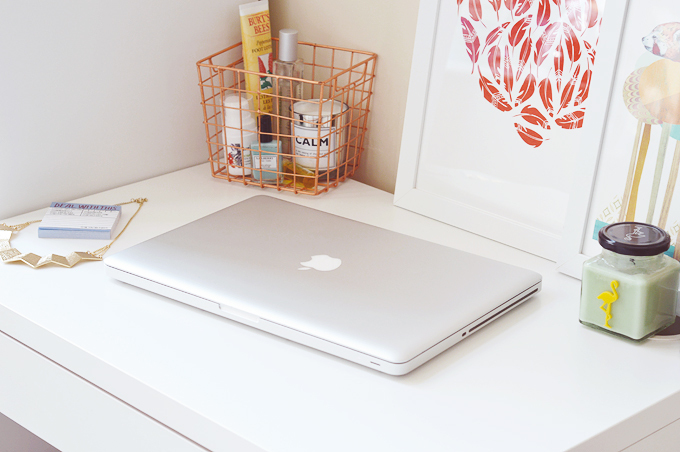 My Macbook takes up 70% of the room on my desk but it's the light of my life so I wouldn't have it any other way. I like rearranging what's on display when I'm sat bored waiting for something to load or save (really need an external hard drive). I did have a second print by Alice Potter on display for a little while but I decided to have it elsewhere. I also burn my Flamingo Candle when the situation is dire as that zesty scent really keeps me going! Agreed! Its functional and beautiful! I am sure a little more space would have given you more writing space but this is cute! non? oh my goodness your office is so beautiful! I love your little orange basket! I'm glad you made yours work for you though!! Mine is has a lot of space width-wise but I would like more (read: deeper) desk space. Too many books! I love your little space, so pretty! I got the same feeling when I bought my desk at Ikea (althought it was a different one) but now that I got used to it I think it's the perfect size for the available space in my home office. I love workspace tours! 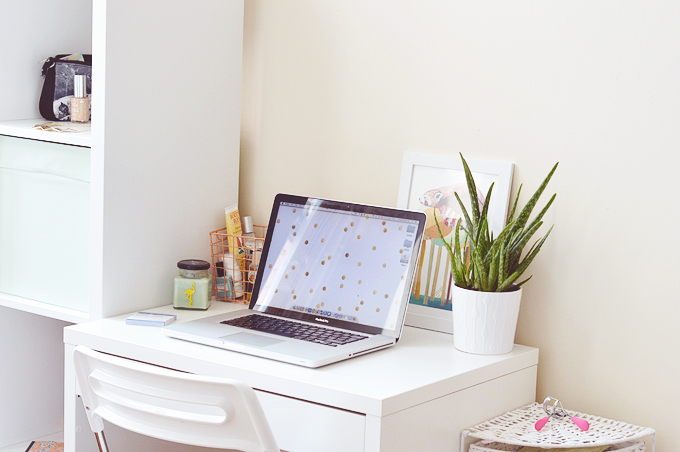 I love how concise and uncluttered your space is. This is actually such a useful post, I was toying between this desk and the larger size, and think I will go for the larger one! Thank you! Your setup is beautiful though, what a lovely little space! I love your little basket - I need to get one of them for school soon. I also made the same mistake as you and bought this desk thinking I wouldn't have space for anything bigger - I recently changed it up however to a bigger desk and I'm a lot happier - although my desk never looked as cute as yours does! Lovely post and great way of making us of the space! I love this! It is small but somehow it works on the amount of space you have! I also like how you customized your little table with bits and pieces (i.e.. basket, plant)! 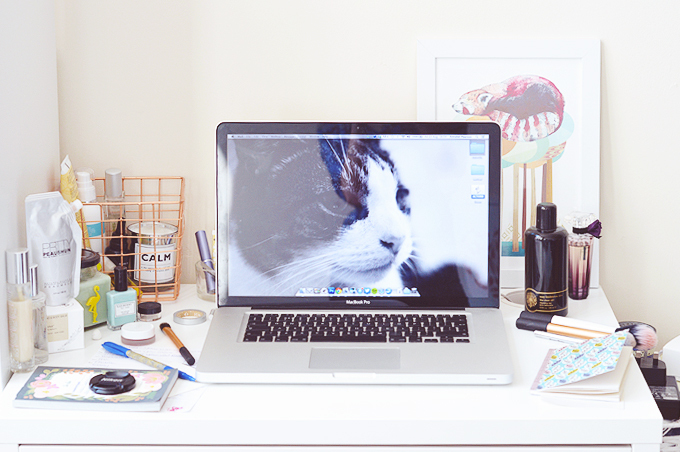 Your desk may be a tad crowded, but it is full of beautiful things! Desk inspiration is always wonderful. I really like your basket and house plant also, the colors make everything seem really alive.